There’s a new trend that seems to be slowly emerging in children’s and young adult’s literature, mixing images and words together to create a story. Yes, I know we all have read picture books; however, usually independent reader books and beyond just sticks to words. Author Ransom Riggs incorporates a new medium into his story, Miss Peregrine’s Home for Peculiar Children. He uses real, old photographs, found at flea markets or through collectors. As his story is read, a picture will display on the next page to give you a visual of what is being described. Riggs does it in such a way that it gives the story a new dimension. 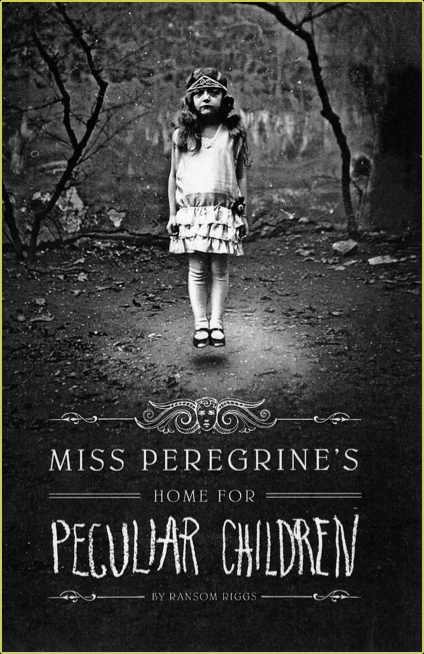 I found Miss Peregrine’s Home for Peculiar Children to be such an interesting, mysterious and original read. Jacob is the main character of the story. He’s sixteen years old and never felt that he fit right in with his life. A tragic turn of events causes him to travel to a small island in Wales, UK. There he discovers something quite unbelievable, and his life is changed forever. Rather vague summary, huh? Well, I don’t want to give too much away. Otherwise, it would be hard to enjoy the story. I went in reading not knowing much about the story, and that’s what really got me into the story. I was curious to know what would happen next, what was *really* going on, etc. Jacob is an instantly relatable character. His status as a misfit is something that many readers can relate to, and his search for understanding is something most end up doing. Although, Jacob’s journey is probably much more interesting and unbelievable than ours. The vintage photographs helps brings this story to life. It added a haunting and mysterious feeling to the story. It set the right tone, and it made me feel more immersed into Jacob’s world. Each photograph is brilliantly picked out. They’re all so interesting and strange; I spent minutes studying each one before continuing on with the story. Also, the story wouldn’t be as effective without them. The words and pictures go hand-in-hand. It wasn’t like he added the pictures just to add pictures. They serve a purpose to work together and give the reader a full and pleasurable reading experience. I absolutely recommend Miss Peregrine’s Home for Peculiar Children. It’s full of intrigue, originality, great characters and offers a different reading experience than the rest. I was happy to find out that Miss Peregrine’s seems to be the first of a series. I can’t wait to see what happens next on Jacob’s journey!